Posted in Mainstream Polish, Manicures, Nail Art, Nail Swatches, pictures, reviews	by Jessica W.
Hi everyone! Just dropping in with a quick post about my current mani. 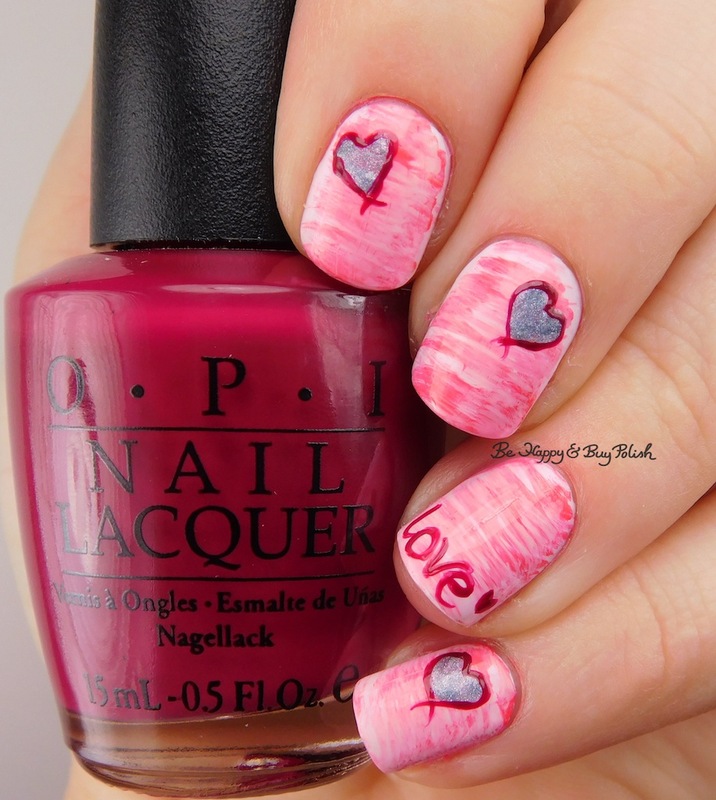 This week the OPI Mad Love fb group’s color of the week is pink and yes it took me all week to be able to sit down and create a mani! (More on why at the life update at the end of this post.) I used all OPI polishes: Mod About You, Suzi Shops & Island Hops, Suzi’s Hungary Again, Charged Up Cherry, My Throne for a Cranberry Scone, and DS Sapphire. Next I blobbed Shops & Island Hops, Suzi’s Hungary Again, Charged Up Cherry on a plastic baggie, then dragged a fan brush through them, then dragged the fan brush over my nails. At this point I was totally meh about this mani. Last I used a dotting tool with DS Sapphire to make hearts, then outlined the hearts with My Throne for a Cranberry Scone. I also wrote “love” in MTFACS. Fun tidbit about MTFACS – this was a polish I had been given to me by my sister in high school. Well, back when I wasn’t a polishaholic, I didn’t realize polishes could be revived with thinner and my bottle got all dried up and gross so I tossed it in the trash! Then after I became a polishaholic, I was on the hunt to buy another bottle, simply because of the memories this specific polish has for me. Every time I use this polish, I think about my sister and the fun times we had when we were younger. 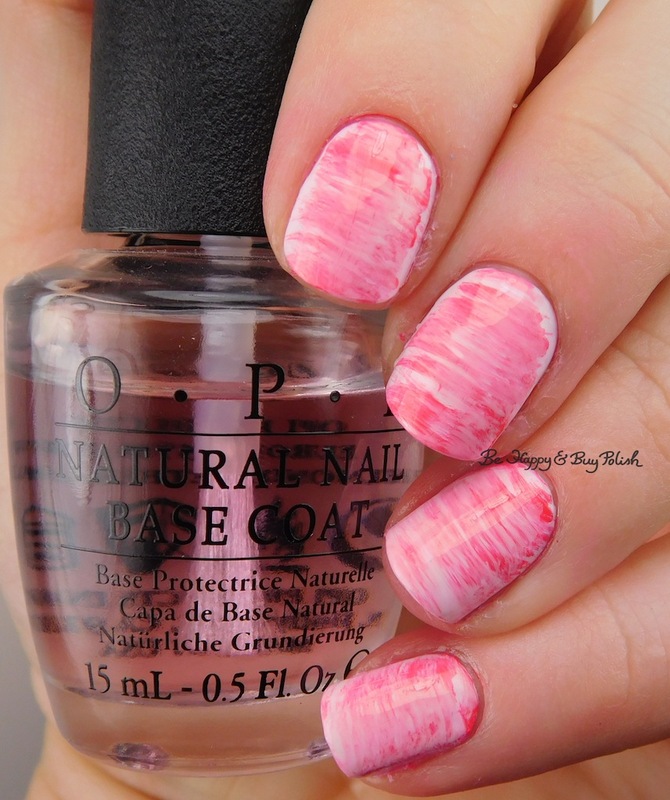 I hope you like this mani! I think it ended up really nicely done. If you like it too, would you consider pinning any of the images, tweeting this post, or sharing on Facebook? Not much to report this week – half of the family has been sick. My eldest boy was sick Saturday & Sunday (staying home from school Monday); then my girl was sick Monday night/Tuesday (staying home from school Tuesday & Wednesday); then I started getting a really bad head cold & cough on Wednesday. So far the toddler, baby, and husband have been spared. I’m so not enjoying this cold/cough – my abs are so sore from the coughing I’ve been doing. 😦 And my husband has a tournament to take care of this whole weekend so it’s just me & the kiddos. Luckily it’s supposed to be fairly nice weather – I’ll just kick the elder ones outside to play all day! Please send us your healing thoughts & prayers so we can all get healthy again! Hope you and your family start to feel better soon. Love the fanbrush, one of my favorite techniques.